We couldn't resist going for a ride on a sunny winter day. I have been cooped up for most of the weekend, organizing a visitation program for the church. A scenic drive was just the ticket. 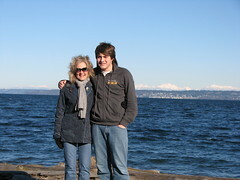 It had been a long time since we had actually explored the back roads of Bainbridge Island. (twenty years, in fact) Calvin joined us for the adventure since we had very little family time this weekend. Even though we can see Bainbridge from our house, it's a long drive away. We explored the perimeter of the island and drooled over waterfront property and million dollar houses. We wrapped up the day with a visit to the buffet at the Clearwater Casino. This evening we are stuffed and ready for a week of work tomorrow morning.